There are some reactions here. I have been using it and VB3 II as a pair using the leslie amp to provide the crunch like you described in one of your posts above. I also use the B5 with it’s own leslie sim, it works well on about 1/2 the pieces I try. IK usually only has sale prices during early buyer faith period they do before a release. The IK goes a long way toward solving the ugly vibrato IMHO. That’s what kills me about the VB3 (v1.4) Leslie- it was the best I had ever tried to that point on the chorus setting but yeah, the fast speed got gnarly. And the overdrive on the IK is very nice, especially with a couple different models to choose from. What they need now is more flexibility in mic placement and mic type and it would be perfect. What they need now is more flexibility in mic placement and mic type and it would be perfect. Time to send an email request to IK. I made a request on mic placements a few days ago. Does it ever go on sale? I sat 2 ft behind Jeff Kazee last night playing with Glad, a band of session guys doing Traffic and Steve Winwood songs. His right hand was playing chords in the top octave of the upper manual much more than I expected with plenty of fast Leslie. The trio stuff I’ve been working on mostly just hits that octave for “lead soloing”. I’ve been listening to Winwood this morning and testing out some of those chords and I’m understanding better what you and Fred are referring to as “ugly vibrato”. I’m playing around again with VB3 1.4 just to compare. The venue, Fairfield Theater Company, has three B3’s maintained by Goff. I am in touch with a few developers, and unless we ask for improvements, they may not happen. The problem I tend to encounter is “a matter of taste” which I understand. Doing this alone tags me as a purist. If they start hearing from more people, they will probably look into it. Mic placement is crucial in these plugs. I have been testing like crazy, and am finding how to give these plugs more life. Without a doubt, there is more to these plugs than what is “out of the box” default. Unfortunately, documentation will not always lead us down the golden path. We are left on our own. What we all have discovered in these plugs, is many times adding an outside effect works much better than the original plug effect. We’ve seen it in amp sims and countless others. We may never see an outstanding Leslie in a Hammond plug. But I still hear rumors of Hammond Software which is already being used in some hardware products. Then we have Hammond Suzuki helping to provide Leslie software to IK. Maybe ??? For those of us who’ve spent many years behind the double keyboard of these beasts, we know every one of them has it’s own personality, and we learn how to bring out the best in them. Such is the digital world. I geeked on my B3/Leslie in the 1970’s cause I was sure there was something more I could get out of it, but eventually found the best I got was in my own fingers. I will be applying that knowledge in tonight’s gig. I know I’ve said this before but imho it’s really all about the Leslie- it’s nice to have a hyper accurate organ source as well but really, you can put just about any damn thing through a real amp and it will sound good. The best organ sound I ever got on record was actually a Hammond/Suzuki XM1 through my 142 powered by a Mesa Boogie head. At the time I owned a CV without harmonic percussion and the only way to get Keith’s sound was the module. Interestingly, we decided a few days ago to pull a song from that album out for next year and I got a pretty dang good approximation of the sound from Blue3 and the IK. I think people that hear it will be impressed. It always has been. I recently pulled up the crap Kontakt Vintage Organs, turned off the vibrato sounding leslie, routed through IK Leslie, and it actually was much better, although crap in…crap out…you know. Those organs were not well developed so I wound up with an amazing swirl of…crap. The professor in my Hammond History 104 course (me ) assigned research on CX3. I was surprised its been around since 1979. Cool! I kind of wish I never sold mine. I don’t know what I payed for it but it was not remotely that much. I bet it was about $600 USD. The Leslie sim in it was, to be charitable, garbage. To me it didn’t exist. I only ran it through my 122 (via the audio outs and combo preamp, not the built-in 6 pin connector). If I would have had to use it totally direct either the Korg CX3 or Roland VK-7 would have been far better. 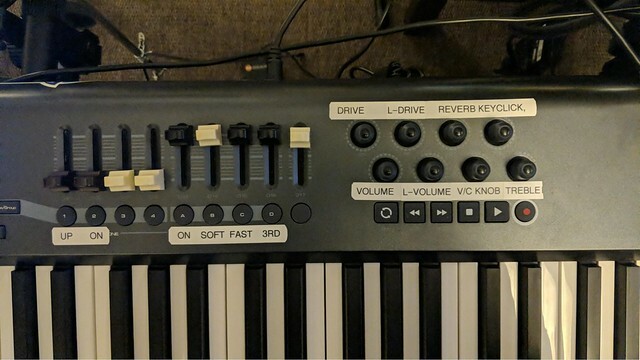 The thing that kept me using it live even when I had the option of a real Hammond was that I got to the point I where used 3 or 4 distinct organ sounds in a given song and the ability to change presets quickly was indispensable. Yeah, I know I could have set presets on a real one too but these were so specific and fast it was just easier. BTW speaking of the CX3, I have a band that has had me mix a couple albums for them and he uses one. I reamped it through the VB3 Leslie on a mix and he got kind of bent out of shape about it That sound was his sound. In the long run the Nord Electro I replaced the XM-1 with was superior. I just modified the rotary controls on my Axiom - I removed VB3 1.4 “Edge” and “Spread” and replaced those with IK Leslie Gain and Volume. After playing a bunch of tunes we’re doing I ended up with much less VB3 II drive and the IK Leslie gain all the way up. Wow, someone just sent me a video of those guys the other day! They are really good. You guys were absolutely right. The IK Leslies make a big difference! What? You expected any less of us? Lovely sound and amazing playing - I am simply in awe of players with chops like that.